Nazari-Moghaddam, A., Najafpour, G., Ghoeyshi, A., Mohammadi, M., Hussein Sharif Zein, S. (2010). Removal of Methylene Blue from Aqueous Phase by Pretreated Walnut Shell in a Packed Column. 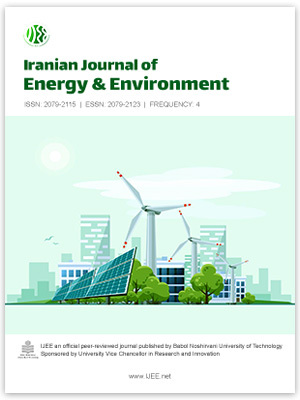 Iranian Journal of Energy and Environment; previously called: Iranica Journal of Energy & Environment, 1(2), -. A.A. Nazari-Moghaddam; G.D. Najafpour; A.A. Ghoeyshi; M. Mohammadi; Sharif Hussein Sharif Zein. "Removal of Methylene Blue from Aqueous Phase by Pretreated Walnut Shell in a Packed Column". Iranian Journal of Energy and Environment; previously called: Iranica Journal of Energy & Environment, 1, 2, 2010, -. Nazari-Moghaddam, A., Najafpour, G., Ghoeyshi, A., Mohammadi, M., Hussein Sharif Zein, S. (2010). 'Removal of Methylene Blue from Aqueous Phase by Pretreated Walnut Shell in a Packed Column', Iranian Journal of Energy and Environment; previously called: Iranica Journal of Energy & Environment, 1(2), pp. -. Nazari-Moghaddam, A., Najafpour, G., Ghoeyshi, A., Mohammadi, M., Hussein Sharif Zein, S. Removal of Methylene Blue from Aqueous Phase by Pretreated Walnut Shell in a Packed Column. Iranian Journal of Energy and Environment; previously called: Iranica Journal of Energy & Environment, 2010; 1(2): -.